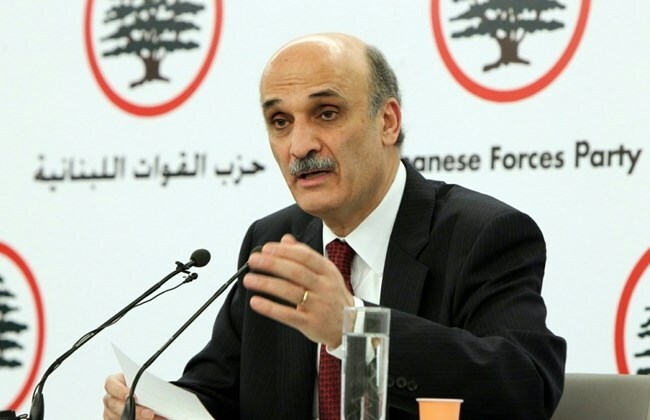 BEIRUT: Hezbollah is the main obstacle preventing the election of a president in Lebanon, and not an inter-Christian dispute, Lebanese Forces leader Samir Geagea said Friday. “How should we believe that some are defending Lebanon in Qalamoun and the rest of Syria, Iraq and Yemen, when the same people are disrupting Lebanon in the Baabda Palace, in the heart of Lebanon?” he asked. Geagea also praised the Military Court of Cassation’s decision to hold a retrial for former Minister Michel Samaha, who was sentenced to four and a half years after smuggling explosives into Lebanon to carry out bombings and assassinations. March 14 officials were enraged by the decision, arguing that he got off too easy. “You did not believe in Lebanon’s institutions, laws and state to end up leaving for your children a system of jungle laws that does not hold the wrongdoers accountable, and places a heavy stone on the graves of martyrs,” Geagea said. Samaha was caught by Internal Security Forces in 2012, after informant Miled Kfoury revealed tapes showing the minister discussing the plots, which were coordinated with Mamlouk, an intelligence aide to Assad. Hasan, then-head of ISF’s Information Branch, was given credit for carrying out the crackdown. He was later assassinated in a bombing in the Beirut neighborhood of Ashrafieh.